It's taken a decade, but Kazakhstan is back at the world juniors. 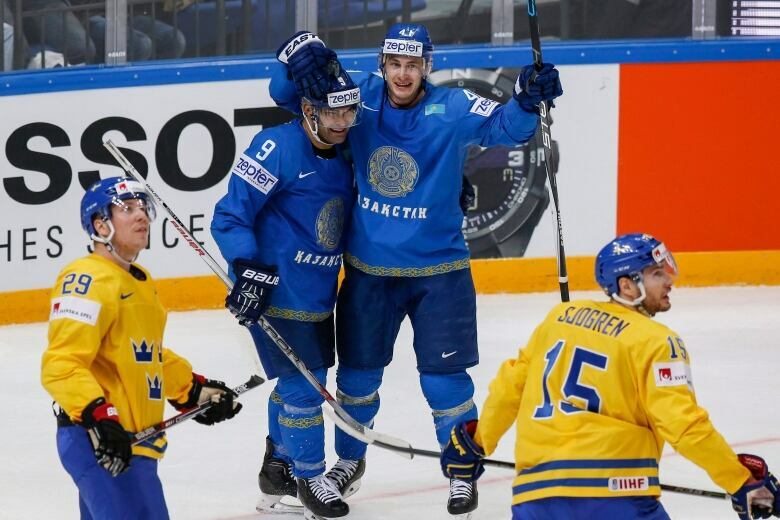 Few are expecting much from Team Kazakhstan when it hits the ice in Victoria on Thursday afternoon against a heavily favoured Finland squad. But the unheralded team from Central Asia may be more ready than first thought, having battled more than most teams to return to the world juniors main event after a decade away. The two last-placed teams in each world juniors group play a best-of-three series, with the loser being relegated into a lower-profile competition that most recently featured non-traditional hockey countries like France, Italy and Japan. Since its relegation a decade ago, the junior Kazakhstan team has fought its way back up through the ranks to earn its spot at this year's tournament. Hockey is "very big" in Kazakhstan, according to former Canadian world juniors alum Dustin Boyd. The former Calgary Flames forward represents the country at the senior level internationally and is now in his seventh season with HC Barys Astana, the lone Kazakhstan-based team in the Kontinental Hockey League. "The fans are great," he says. "They support the sport so it's fun to play here." At this year's world juniors, having fun might be tricky in a group with not only the powerhouse Finns, but also strong Swedish and American sides and a Slovakian team that's produced several NHL players over the years. Avoiding the relegation series won't be easy. But through an official team translator, coach Sergey Starygin says he expects his team to not only hold its place but to also possibly pull off an upset. Kazakhstan hasn't had many victories in its relatively short hockey history. Before it became an independent country, its best players, like defenceman Evgeny Paladyev who played in the 1972 Summit Series against Canada, were swallowed up by the Soviet Union's sporting machine. Since then, the country has produced 19 NHL draft picks, five of whom went on to play in the league. Former Toronto Maple Leaf Nik Antropov and former Detroit Red Wings Stanley Cup winner Maxim Kuznetsov, as well as Kazakh-born Russian international Evgeni Nabokov, are likely the country's most recently recognizable hockey names. More recently, the country's senior national team has drawn from non-Kazakh born KHL players including Boyd, as well as fellow Canadian NHL alums Nigel Dawes and Brandon Bochenski. "We thought it would be a good opportunity," said Boyd. "We play with those guys all year around so why not try to help them?" To survive, Kazakhstan will have to dig deep for a shock victory — something the country's teams have done before. At the 1998 world juniors, Team Kazkhstan stunned an apathetic Canadian team 6-3 in the seventh-place placement game. A few months later at the Nagano Olympics, the country's senior men's team upset a Slovkia side featuring the NHL's Peter Bondra and Lubomir Visnovsky to reach the quarter-finals. Usually though, it's gone the other way — including a 15-0 drubbing by Canada at the 2009 world juniors. Forward Artur Gatiyatov had seven points in five games at last year's Division I tournament and is this year's top goalscorer for the team. On defence, Valery Orekhov has already played two KHL seasons with Barys Astana, and will be among his country's most experienced players in Victoria. "He's got great speed, and he likes to join the rush a lot," said Boyd of his club teammate. "He's a pretty good player so I'm looking forward to see how he does against top competition over there." Boyd says while Kazakh teams embrace the underdog role, he's hopeful a day will come where they can play as favourites. "They've got lots of hockey programs here for the young kids," he said. "It just takes some time for them to develop a lot of young good players."